They may not have won in the end, but the under-15s produced the stand-out Northend United Youth performance of the weekend. Johnny Sayers’ boys raced into a two-goal lead at half-time against last season’s Lisburn League winners Oxford Sunnyside, before having a man dismissed and playing the entire second half with ten men, finally ending the game with a 2-2 draw. The U13s had a rare appearance in Ballymena but lost their match against Chimney Corner by a single goal margin in an end to end match played at the Showgrounds with Callum Forsythe scoring a wonder goal for the Blues. The U14s had a free week while the U16s lost their cup quarter-final match against Lisburn League leaders Downpatrick. The younger competitive teams had a mixed bag of fortune in the North West and Coleraine District league. The U8s started off the weekend with three teams representing Northend on Friday night at the Irish FA Small Sided Games Tournament held at the Showgrounds. This was followed on Saturday morning by the U9s who finally got back to action following their winter break. The Club was again represented with three teams at this age level, showing the strength in depth of the Club’s youngest teams. The ever growing Small Sided Games for U9s organised by the IFA at Ballymena Showgrounds recommenced on Saturday after a long winter break. The tournament is now up to 9 teams and in blustery conditions all teams played 5 games including a Northend derby which was a joy to watch with the development and respect showed by both teams clear to see. Northend Pumas Panel: C Martin, P Murphy, P Martin, A Long, C Lutton, T Hasson, R Dunne, C O’Hara and C Reid. Northend United 3, Portrush 1: The first goal came within 5 minutes when Eoin Mitchell pressurised the defence into a mistake and he quickly pounced to fire a shot into the top left corner. In the second minute of the second half, a defensive lapse by Northend let the Portrush striker through for an easy finish to bring Portrush level. Lee Turner came on and one of his runs resulted in a throw in which ended up with Jay McKeown inside the box who turned and powered the ball into the back of the net. Within 2 minutes they got their third and decisive goal with a brilliant effort from Ryan Campbell who picked the ball up in his own half, ran into the Portrush half, then knocked it past the oncoming player before unleashing a thunderbolt from 20 yards into the far corner. Northend United 0, Dungiven Celtic 2: Northend were unfortunate not to get something from this game, losing to two second half goals in a match in which the Dungiven keeper made a number of great saves. MOM - Corey McMillan, Curtis Wilson. Northend: C Wilson, D Magill, P Bristow, J Adams, K Cosgrove, J McIlhatton, O Campbell, C McMillan, L Hector, D McKay, C McMurray. 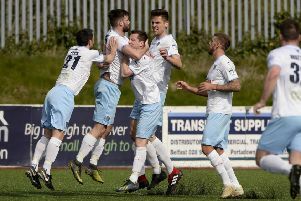 Northend Youth 1, Ballycastle United 2: Within the first minute Cal O’Brien had put the Northend boys ahead with a cracker and the Ballymena thought they had a second only for the referee to adjudge that the ball hadn’t crossed the line. Ballycastle levelled before the interval and then, in an evenly matched second half, it was Ballycastle who took the crucial chance. Northend: C Lennon; D Killough; C O’Brien; S Crawford; N Devine; S Byrne; B Harkin; J Connor; C Martin; C Mellon; C McKillop. Northend United 2, Coleraine Alexandra 0: After a scoreless first half, Northend took the lead deservedly though Calum Kilgore when the ball fell to him on the edge of the box from a corner and he rifled it into the corner of the net. Northend: C Higgins, H Wylie, J Morrow, C McGaughey, J Montgomery, P Ferris, A Campbell, R McKillop, R McQuillan and C Kilgore. Northend United 1, Chimney Corner 2: In a scoreless first half, Northend came closest when Conor McDonald hit the crossbar from 25 yards with an unstoppable shot. Northend: J Givens, C Forsythe, J Coates, O Connelly, R Mark, C Meeke, M Stewart, R Gamble, C McDonald, M Rainey, C Metrustry, J Kirkpatrick. Oxford Sunnyside 2, Northend 2: First half goals from Kuba Babuszewski and Sam Hutchinson put the boys in a commanding position. Northend: J Mark, J Penny, D Dobbin (c), A Shaw, B Millar, R Laverty, S Hutchinson, A Campbell, R Campbell, K Babuszewski, J Wharry, M Kirk, E McLaughlin, J Adams, J Hayburn. Downpatrick 3 Northend United 0: This Lisburn League Cup quarter final match was a much closer affair than the scoreline suggests with the strong wind playing a major part. The Blues were missing a few regulars for this match and it was always going to be an uphill task against the current League leaders. All at Northend United send best wishes to Ross Horner, a goalkeeper who started this season with Northend U16s in the Lisburn Youth League before moving onto Donegal Celtic and who signed for Chesterfield of English League One at the weekend during half-time in their match.